Single or multiple ulcerations of the oral mucosa; usually self-limiting, painful, or recurrent. Pain severity depends on the variant, but is often out of proportion in relation to the size of the lesions. Attacks may be precipitated by a variety of events including local trauma, stress, food additives/preservatives (e.g., cinnamaldehyde, sodium benzoate), medications, hormonal changes, vitamin deficiencies (B12, folic acid), iron deficiency, cessation of smoking, and possible sensitivity to sodium lauryl sulfate. Genetic, immunological, and microbial factors have also been implicated in the onset of recurrent aphthous ulcerations. Recurrent aphthous ulcerations may be a marker for an underlying systemic illness such as celiac disease/inflammatory bowel disease, vasculitis (e.g., Behcet syndrome), reactive arthritis (e.g., Reiter syndrome), and HIV/AIDS. Perform a complete extraoral (head and neck) and intraoral examination. Review past dental history to rule out any local pathology as a source of pain. Common pathologies might include a traumatic ulceration: arising from a fractured restoration, tooth, or denture. Based on the clinical examination and on the patient’s medical history, a diagnosis of aphthous ulcers is determined. Corticosteroids (high-potency topical agents usually in combination with antifungal prophylaxis and/or systemic medication). Consider referral to health care provider with advanced knowledge/expertise in managing patients taking these types of medications. 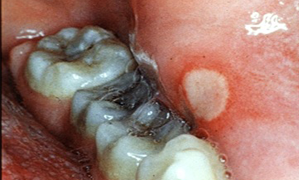 Patients who suffer from frequent, recurrent episodes of aphthous ulcers should be referred to either an oral medicine/oral pathology specialist or their physician to rule out any possible systemic association with recurrent aphthous stomatitis. Laboratory investigations may include complete blood count with differential, serum iron/folate/vitamin B12 levels, and additional tests (as deemed appropriate) to rule out other possible underlying systemic disorders. Screening for celiac disease may also need to be ruled out. Dr. Clark is clinical director of dental services at Ontario Shores Centre for Mental Health Sciences and associate in clinical dentistry with the department of oral medicine, faculty of dentistry, University of Toronto. Preeti L, Magesh KT, Rajkumar K, Karthik R. Recurrent apthous stomatitis. J Oral Maxillofac Pathol. 2011;15(3):252-6. Rashid M, Zarkadas M, Anca A, Limeback H. Oral manifestations of celiac disease: a clinical guide for dentists. J Can Dent Assoc. 2011;77:b39. Scully C. Clinical practice. Apthous ulceration. N Eng J Med. 2006;355(2):165-72.